It’s amazing how much controversy can be caused by sheer luck. The photographer was Neil Leifer, a 22-year-old hopeful at Sports Illustrated. He was known for his excessive preparations, but it didn’t matter how early he arrived to the arena. The first pick of a seat went to Herb Scharfman, a senior photographer at Sports Illustrated, who chose to sit by the judges’ table. Leifer was forced to choose the opposite side of the ring. There are small differences, such as the positioning of Scharfman’s head and Ali’s expression. Yet despite only having small differences, Rooney’s photo was the one that made front pages all over the country. Months after the fight, Leifer submitted his photo to the “Pictures of the Year” contest; again, it wasn’t good enough. Years later, Leifer’s photo would be selected as Sports Illustrated‘s cover photo for the issue on “The Century’s Greatest Sports Photos”. 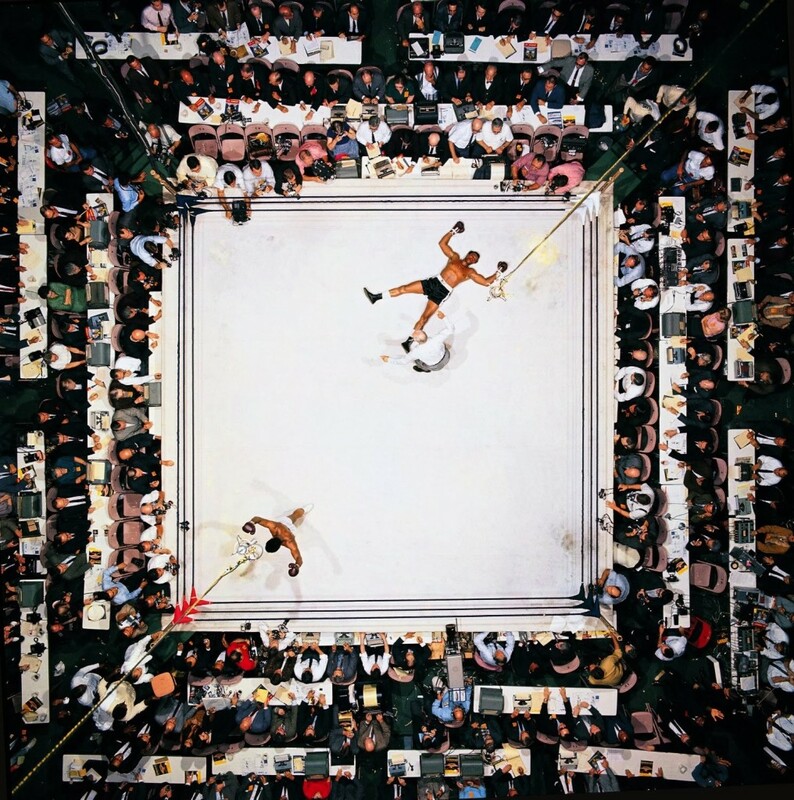 The London Observer chose the image as their number two picture in “The World’s 50 Greatest Sports Photographs,” listing Leifer’s picture of Ali vs. Williams as number one (shown below). “If I were directing a movie and I could tell Ali where to knock him down and Sonny where to fall, they’re exactly where I would put them,” said Leifer. But it’s not just the positioning and coloring that makes this photo iconic. 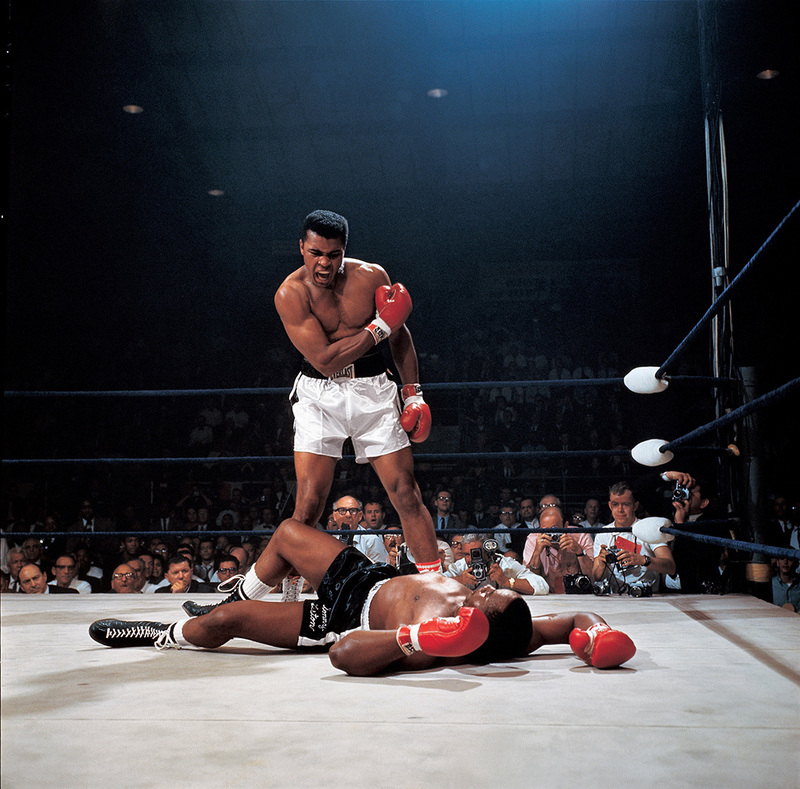 “This photo shows Ali at the height of his powers,” Leifer said. “People wanted to remember him at his best.” And here’s where we have to understand the fighters and what really happened between them that night. Liston grew up as the 24th of 25 children, dealing with an abusive father until his teens. He escaped to Chicago with his mother and boxed to make money. “He never learned to read or write. After his lack of acceptance after his title, buoyed by insecurities from a lack of education, he sunk further and further into his Mafia connections.” With fists 15 inches around and a reach of 84 inches (one of the longest in heavyweight history), Liston wasn’t someone to mess around with. Once, five cops jumped Liston and beat him until they “broke [their] hickory nightsticks” and “still couldn’t get cuffs on him.” Another time, Liston dumped a cop headfirst into a trashcan, and on another occasion he broke his arrestor’s knee, took the gun, and walked away wearing the cop’s hat. 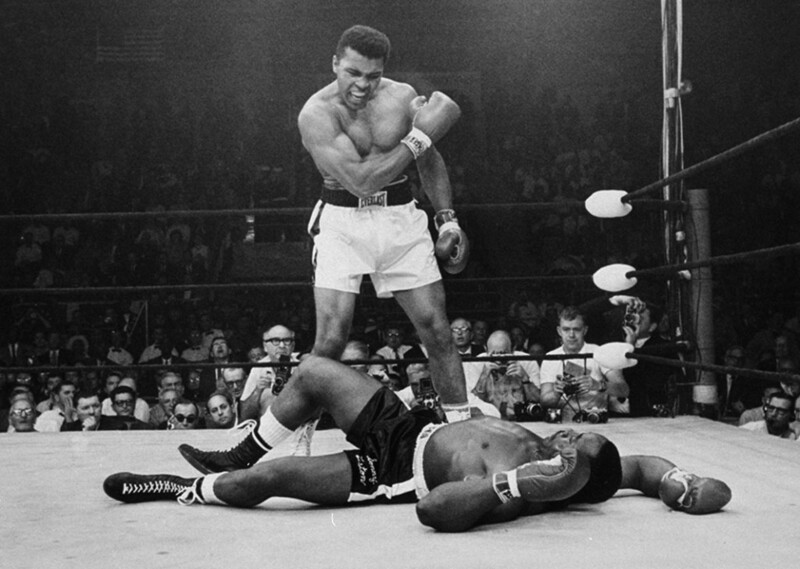 So Ali (known at the time as Cassius Clay) fought Liston. “And the very day after his big Liston victory, Cassius Clay announced that he was changing his name. He might as well have announced outright opposition to the Vietnam War! Which he soon did. And just like that, public opinion flipped. The day before, Liston had been the baddie, but now everyone wished he’d won. A simple equation, it turned out: The one thing white America hated more than a black man with a criminal past was a cocky black man with radical politics.” They set a rematch for May 25, 1965. It was a pretty anti-climactic fight. Leifer’s photo seems action-packed and exciting, but there was far too much debate over the ending. “Midway through the first round, Liston fell to the canvas, even though he seemed to have dodged Ali’s punch, and no witnesses on site could say they saw Ali connect. Nonetheless, with Liston suddenly and inexplicably down, referee Joe Walcott ordered Ali to retreat to a neutral corner. Ali refused; instead, he stood over his fallen opponent, gesturing and yelling, ‘Get up and fight, sucker!’ [I wonder if that’s a censored quote.] Ali wanted a clean victory—and this smelled fishy—but no matter; before anyone knew what was going on, Walcott declared Ali the victor, and the fight was over…. The blow that ended the match became known as ‘the phantom punch.’ Even Ali was unsure as to whether or not he’d connected; footage from the event shows Ali, as he exits the arena, asking his entourage, ‘Did I hit him? '” Slow-motion replays confirm Ali did hit Liston, but it doesn’t seem like a hard enough hit to take down a guy like Liston. “The truth is,” Leifer said, “I haven’t seen the knockout punch in half the great fights I’ve covered. You’re thinking of strobe lights, batteries, and so many other things.” Leifer’s photo captured Ali’s “Get up and fight, sucker!”, which is a little different from how the viewer originally perceives the photo. But “This photo became the way people wanted to see Ali – charismatic, tough, confident. The circumstances didn’t end up mattering,” said Leifer. I guess sometimes the gambles pay off. I would congratulate Leifer and I think he deserves all the credit. He took a huge risk, and made an even bigger profit. I do feel a little bad for Rooney, but oh well, he decided to be normal that day. Leifer went out on a branch, and it payed off, Kudos to him! I too enjoyed the background that you gave here in this piece. I actually have a poster of this photo hanging in my room, so I’m quite familiar with the broad message that it sends. But I like how you dived into the context of the photo along with a history of how it came to fruition. I was able to learn a lot about something that takes up a lot of space in my tiny establishment. So I guess you’re saying that it’s the smelling salts that cause Ali to “float like a butterfly and sting like a bee” then? Because it sounds like he wasn’t doing so hot until he got some of those, but after that he was fire. I think that I’ll claim that his whole boxing career was just one smelling salts-induced haze of violence and rage, which resulted in him becoming the icon he is today. Of course not really, but the story is a LOT different than I ever expected, I have to say. Hrmm, I wonder what films Leifer has directed…I’ll have to check him out for sure! This photo is fantastic, but what I really enjoyed is the background information you uncovered. I actually had to do several projects on Muhammad Ali so I have heard of the Nation of Islam theory (it’s intriguing for sure, I wouldn’t be surprised). However, I never knew much of Liston until now. If all holds true, the man was incredibly durable and had immense pain tolerance! Poor Scharfman though…:(. Seniority definitely did not help him in this case. I feel bad for Rooney as well due to the fact that Leifer now unintentionally has credit for both photographs. Iconic photograph though and a superb post! I can’t wait for next week’s!